In 2018, the consumption of coal hit a four-decade low in the United States. A total of 19 coal-fired plants to closed last year, making for one of the largest waves of such retirements in the single year. Ohio's Adams County was hit twice as hard, it could be said, when two coal plants, called J.M. Stuart and Killen, closed there on the same day. 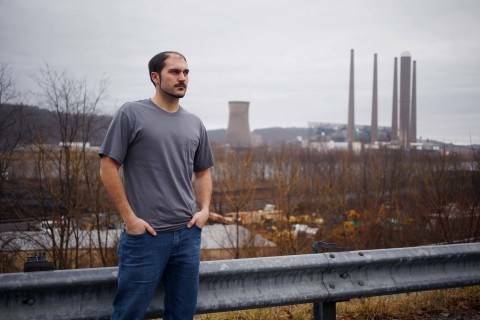 The Post's Brady Dennis and Steven Mufson report on what happens to one rural county east of Cincinnati when about 700 well-paying coal jobs vanished. ...in places like Adams County, with a population of about 28,000 and already one of the poorest corners of Ohio, the death of a coal plant also can leave an unmistakable void. When the Stuart and Killen stations closed last year, with them went the area’s highest-paying jobs, its largest employers, its biggest taxpayers and, in many ways, its lifeblood. In the months since last year’s closures, workers fled for jobs in Wyoming, Florida, Washington, Idaho, Wisconsin, Colorado, Oregon and elsewhere. The local school system has seen enrollment plunge and has cut positions to make up for budget shortfalls. Of the plant workers who stayed in Adams County, some have used federal assistance to enroll in community college to train for other trades, such as welding or electrical work. Others have competed with their former co-workers for a handful of industrial jobs in the area, some of which offer lower pay and require longer commutes. Some workers, like 58-year-old Linda Kirschner, felt too old to begin a new career but are too young to tap into their retirement savings. Of course, all this didn't happened without a herculean effort on the part of the workers at the generating stations to appeal to everyone they could to keep the plant open — including President Trump and his administration. ....local officials and union workers in Adams County scrambled to salvage them. Ty Pell, president of the county commissioners, traveled to the state capital, as well as to Washington, to seek help from Ohio’s elected officials and from Vice President Pence. Employees went on television, imploring Trump to intervene. Union officials urged the owners to seek new buyers. In recent years, coal has increasingly difficult time competing with cheaper and cleaner alternatives, such as natural gas and solar and wind energy. That decline has engendered different responses from different sides of the political spectrum. The Trump administration has tried to roll back regulations on both coal mining and coal-fired power and even proposed new rules that would subsidize coal generating stations. Democrats advocating for the Green New Deal, however, call for a "just transition" for such workers that guarantee them high-quality jobs. — Three days, three legal setback: Last week, Trump’s energy and environmental agenda faced a trio of legal setbacks in three days, The Post's Juliet Eilperin reports. Last Friday, a federal judge ruled that Trump’s executive order to open Arctic waters to oil drilling was unlawful. U.S. District Judge Sharon Gleason said the Outer Continental Shelf Lands Act, which gives the president the authority over offshore drilling, “expressly allows for leasing withdrawals but does not state that a subsequent president can revoke those withdrawals without congressional approval." That, for now, takes 128 million acres of federal waters off the table for energy exploration. That same judge on Friday also blocked a Trump administration-arranged land swap in Alaska meant to pave the way for constructing a road through the Izembek wilderness there in order to improve access to the community of King Cove. And finally, also last week another judge, U.S. District Judge Lewis T. Babcock, said the Trump administration illegally approved two gas drilling plans in western Colorado. "The judge said officials did not adequately analyze wildlife and climate impacts in their plans — which were challenged by a coalition of environmental groups — to drill 171 wells in North Fork Valley, which provides key habitat for elk and mule deer." — Senate Democrat calls for Interior watchdog probe into Trump nominee: Sen. Ron Wyden (D-Ore.), who grilled acting Interior Secretary David Bernhardt during his confirmation hearing last week, sent a letter to the agency’s inspector general calling for an investigation into a report that he stopped the release of a Fish and Wildlife analysis on toxic chemicals. “I am deeply troubled by what appears to be a political appointee meddling in the scientific process at USFWS in its analysis of toxic pesticides and their effect on the environment and hundreds of endangered species,” Wyden wrote in the letter. Wyden called for more information from the inspector general’s office on Bernhardt’s role in the analysis and for an assessment of some of his claims under oath during Thursday’s hearing. — Pipeline plans: President Trump has signed an order to allow construction of the Keystone XL pipeline, the “latest effort to jump-start one of the most controversial infrastructure proposals in recent U.S. history,” The Post’s Juliet Eilperin and Brady Dennis report. Last year, a federal court judge had paused the project saying the administration had not adequately considered the environmental consequences of the pipeline. — Disaster aid at an impasse over Puerto Rico: A partisan standoff has erupted over the disaster funding bill covering much of the United States, sparked by Trump’s opposition to more disaster funding for Puerto Rico. And the tension threatens to doom legislation that’s up for a Senate vote on Monday, The Post’s Erica Werner and Jeff Stein report. The impasse could delay indefinitely a bill providing more than $13 billion in critical recovery funds after California’s wildfires, Hawaii’s volcanic eruptions, hurricanes in the South and flooding in the Midwest. The details: Democrats are against the Republican bill, “contending that the $600 million it contains for Puerto Rico’s food stamp program ignores broader needs on the island. They are accusing Trump and the GOP of indifference toward Puerto Rico as the territory continues a nearly two-year recovery from Hurricane Maria, arguing the Trump administration has been slow to make funding available.” Meanwhile, Republicans have accused Democrats of grandstanding over Puerto Rico. — “Breaches everywhere”: Meanwhile in the Midwest, hundreds of miles of levees have been breached and overtopped following severe flooding in the Midwest, leaving Nebraska, Iowa, Missouri and other states without critical protection. And the aging levee system in general has left questions about what to do in the future. “And with the fear of more floods in the coming years — and perhaps even the coming weeks — many people said living and farming near the water might not be viable much longer without major changes” the New York Times reports. — Amphibian apocalypse is twice as bad as scientists thought: A deadly fungal disease called chytridiomycosis has contributed to declines in more than 500 amphibian species, with 90 species thought to have gone extinct because of it, according to a landmark study published last week in the journal Science. “Populations in tropical Australia, Central and South America seem to be hardest hit, though populations in Africa, Europe and North America are also affected. According to this accounting, the epidemic has caused the worst loss of biodiversity of any disease ever recorded,” Jason Bittel writes for The Post. By comparison, the relatively well-known West Nile virus affects just 23 bird species. — PG&E’s wildfire woes continue: A federal judge wants to block PG&E from making dividend payments to shareholders until it reduces its role in sparking wildfires in California, the Wall Street Journal reports. U.S. district court judge William Alsup, who has overseen the utility’s probation since it was convicted of safety-related violations in 2010, wants the company to meet its goals of trimming trees near power lines. — Chemical storage site too risky weeks after fire: The chemical storage complex near Houston is still too hazardous for investigators to gain access two weeks after the site erupted in a blaze. “Intercontinental Terminal Co. is still trying to drain millions of gallons of volatile oil byproducts from tanks damaged in the four-day blaze that began on March 17,” Bloomberg News reports. “The ground around the tanks is also saturated in dangerous fluids, severely restricting access to the facility 20 miles east of downtown Houston.” And still, carcinogenic benzene plumes are erupting over the disaster zone and nearby areas, the company says. The House Natural Resources Subcommittee on National Parks, Forests and Public Lands holds a legislative hearing on Tuesday. The Senate Energy and Natural Resources Committee holds a hearing on the 2020 budget request for the Energy Department on Tuesday. The Senate Environment and Public Works Committee holds a hearing on oversight of the Nuclear Regulatory Commission on Tuesday. The House Natural Resources Subcommittee on Water, Oceans and Wildlife holds a hearing on the state of Western water infrastructure and innovation on Tuesday. The House Natural Resources Subcommittee on Energy and Mineral Resources holds a legislative hearing on Tuesday. The House Energy and Commerce Subcommittee on Environment and Climate Change holds a hearing on state and local action to combat climate change on Tuesday. The House Appropriations Subcommittee on Interior, Environment and Related Agencies holds a hearing on the EPA budget on Tuesday. The House Appropriations Subcommittee on Energy and Water Development and Related Agencies holds a hearing on the budget request for the Department of Energy and National Nuclear Security Administration on Tuesday. The Senate Commerce, Science and Transportation Committee holds an executive session on various legislative measures on Wednesday. The House Appropriations Subcommittee on Interior, Environment and Related Agencies holds a hearing on the budget for the National Parks Service, Fish and Wildlife Service and U.S. Geological Survey on Wednesday. The House Appropriations Subcommittee on Energy and Water Development and Related Agencies holds a hearing on science, energy and environmental management programs on Wednesday. The Senate Appropriations Subcommittee on Energy and Water Development holds a hearing on the 2020 budget request for the National Nuclear Security Administration on Wednesday. The Senate Appropriations Subcommittee Interior, Environment and Related Agencies holds a hearing on the 2020 EPA budget request on Wednesday. The House Appropriations Subcommittee on Interior, Environment and Related Agencies holds a hearing on the Bureau of Land Management, Bureau of Ocean Energy Management, Bureau of Safety and Environmental Enforcement budgets on Thursday.